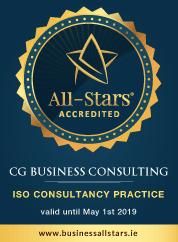 Your organisation could benefit from a FREE ISO 5001 Consultation with CG Business Consulting. ISO 50001:2011 Energy Management Standard replaces I.S. EN 16001:2009 and is compatible with the widely used ISO 9001:2015 Quality Management Standard and ISO 14001:2015 Environmental Management Standard. It has international recognition and is now considered the benchmark standard worldwide for Energy Management. You could improve your company’s profitability and make a positive impact on its carbon footprint. Enterprise Ireland are offering funding of up to €35,000 towards implementation of management systems for energy and the environment. More on ISO 5001 here.